People choose to buy portable solar panels because they are an incredible resource. Travelers can use these to charge smartphones, tablets or laptops. We reviewed the best portable solar panels of 2019 so that we can help you buy the best product for you. The buying guide includes tips on what to look for, how to estimate the wattage that you need, and how to protect your devices. Many people like to live adventurous lives by clearing their minds through nature. Outdoor activities in the mountains, lakes, or forests are what bring them happiness. However, these outdoor activities take place in wild areas with no access to power from the grid. Despite wanting to go into the wild for new experiences, we also want to connect ourselves to the world and use our electronic devices to share our lives with the people we love. Renogy is one of the best solar brands, which is why it often receives some of the most positive reviews. The brand provides portable solar kits, deep cycle batteries, charge controllers, inverters, and wires. 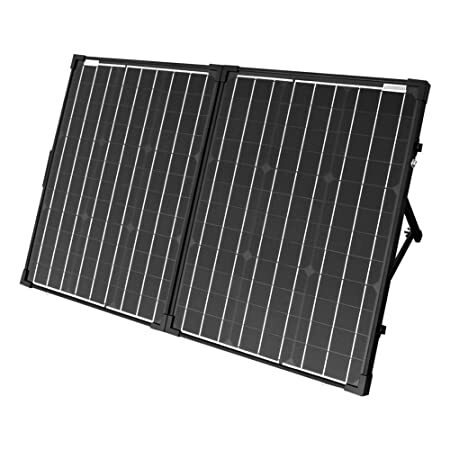 The Renogy 100-Watt Monocrystalline Foldable is a ready-to-go solution for the off-grid market. The product includes an entire solar power system with a compact design and a 26.60 lb. weight. 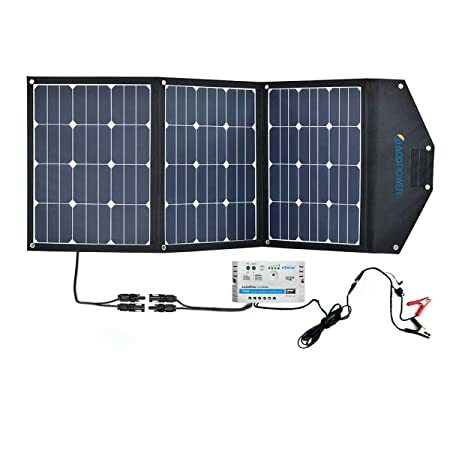 This solution includes two 50W monocrystalline 12V panels, an amazing integrated waterproof Voyager charge controller that is already wired and connected in the backside of the panel, and a 10 ft. cable with alligator clips. Among some of the incredible features of this product, we can highlight the reliable and adjustable corrosion-resistant aluminum stand that includes a protective casing and a heavy-duty handle. Moreover, the Voyager waterproof charge controller is compatible with lead-acid and lithium battery packs, including GEL, AGM, and flooded batteries; covering all the storage options in the market. 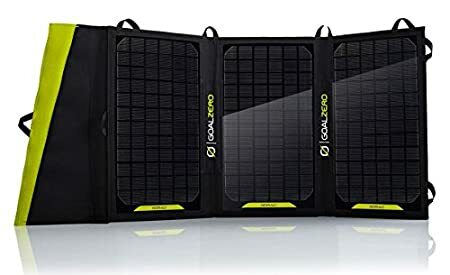 Goal Zero is another popular portable solar brand that focuses on providing off-grid and portable solutions that range from solar panels, lanterns, power stations, and more. Designed for the adventurous market. The Goal Zero Yeti 400 is one of the best portable solar panels on the market. The kit includes a 396 Wh lead-acid battery portable power station that can power up to 7 devices at once that consume 33 Ah at 12 V each. This power station includes dual USB ports of 2.1 A to act as phone chargers, to charge laptops, tablets and other small devices. The capacity of this product allows it to charge a phone 30 times, charge a laptop 5 times and use the dual USB ports for other applications such as portable speakers. 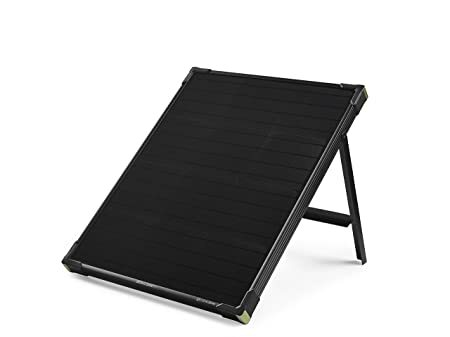 The solar kit also includes a 50-watt monocrystalline Boulder solar panel with a strong tempered glass, reinforced corners, and an aluminum frame that includes a kickstand to adjust the tilt at 45°. There are other wattage options as well, suited for 100 W and 150 W, along with folding solar panels. The solar kit also includes a portable solar briefcase to conveniently transport all the devices at once. Battery Type: AGM – 29 lbs. Go Power is a remarkable brand in the off-grid industry that provides solutions for refrigeration, HVAC systems, and portable solar kits. 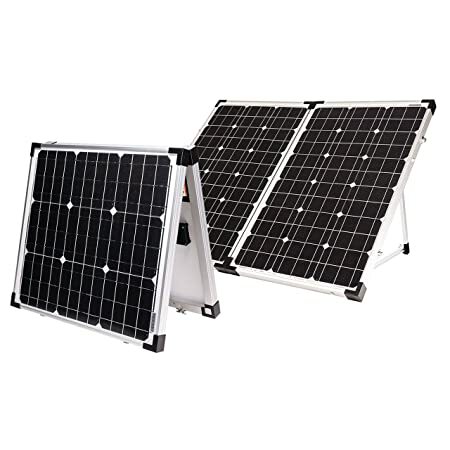 The Go Power LLC GP-PSK-120 Solar Kit 120 W is a +-*built-in solution with two 60 W monocrystalline solar panels, adding a total of 120 W. The kit includes a 15 foot cable along with alligator tabs for batteries and adjustable folding legs to maximize solar power. 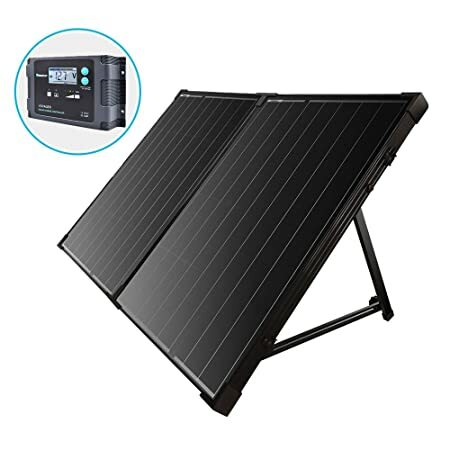 The solar kit includes a 10-amp PWM charge controller already attached in the back of the solar panels to be connected to any lead-acid battery. A useful (and very handy) application of this charge controller is that comes integrated with an USB-port to charge your cellphone or iPad. These convenient product can be installed as a valuable solar charging option for batteries, especially for those who want to have a home solution. Another model is available for 80 Watt. HQST is another company that offers off-grid solutions to the market that go from premium and starter kits to marine solar panels. The HQST 100-Watt Polycrystalline Portable Foldable Solar Panel Suitcase kit offers a 100 W solution integrated by polycrystalline solar panels. It also comes with a travel suitcase that makes it the perfect product for the portable solar market. The solar panel has 36 solar cells and a 22 V output for open circuit voltage. The PWM charge controller available has a 20 A output and can be coupled with 12 V and 24 V battery systems, along with 10 feet of wiring to connect your charge controller with your battery. The charge controller also includes overvoltage protection, 3 stages of charge, and it takes around 2 hours to charge in boost stage. The device includes a particular temperature sensor that performs an accurately charging for your battery bank. The best thing about the kit is that you can bring your modules anywhere because they are not heavy. You can use your applications all day while connected to the batteries. The ACOPOWER UV11007GD Foldable Solar Panel Kit model offers two foldable 50 W and monocrystalline modules with an open circuit voltage of 22 V and efficiency values close to 15.4%. The kit includes a suitcase designed for easy transportation, and it keeps your solar panel kit safe while it is being transported. The kit is able to charge generators with MC4 connectors. It is also equipped with ready alligator clips and it is able to expand the system to 140 W by adding a 40 W portable solar panel. The PV kit also includes a 10 A PWM charge controller suitable for 12 V sealed, GEL, and flooded battery that integrates electrical protection from overheating, overcharging, overloading, short circuiting, and it even prevents reverse connection. Regarding the support, it has a corrosion-resistant aluminum frame which is suitable for outdoor uses, with adjustable kickstand legs to optimize the tilt angle and maximize the solar power output. Other available sizes for this product have 60 W and 200 W power outputs. The ACOPOWER HY-3x35W18V2 is one of the top portable solar panel kits of the brand. The kit is composed of the most efficient portable solar panels in the market with 21.6% efficiency from the most efficient solar panel manufacturer: Sunpower. The kit includes 3 modules of 35 W each, which represents a power output of 105W. The portable solar panel kit is able to charge 12V lead-acid batteries of different types: sealed, flooded, and those with a better battery life such as GEL and AGM. The batteries can be charged using alligator clamps, which are included. Moreover, there is a 5V USB port to charge your phone and other devices. The kit is also waterproof and has a strong weather-resistant design. One of the amazing features is its portability; with dimensions of 22×17.32 inches and an ultra-light weight that fits within a portable suitcase. The solar kit also includes a PWM charge controller of 10A with a USB port output that can be matched with a DC/AC inverter to charge laptops and other devices that require AC. Other available sizes for the solar kit are 50 W, 70 W, and 120 W.
Dimensions: 22 x 17.32 inches. The Goal Zero Nomad 20 is an outstanding portable solar kit with a built-in junction box and a smart charging chip that enables you to charge your electronics with solar power through USB ports. The portable solar panels can be coupled with any of Goal Zero’s power packs such as the Yeti 150, Yeti 400 or the Venture 30. The kit uses monocrystalline technology to deliver 20 W of power. It is important to mention that the Goal Zero Nomad 20 does not store energy itself, an additional battery pack solution is needed to store the excess solar energy. The product is intended to act as a portable solar solution to power 12V devices such as smartphones, GPS, iPods, and Goal Zero power packs. Moreover, the Nomad 20 solar panel is waterproof, weather resistant, and can be coupled with other solar panels to increase the power output and increase charging speed. Goal Zero has been present in many disaster situations around the country, and this solution has provided safety and electricity in conditions where the power grid cannot provide electricity to the region. Other product sizes are available at 7W and 13W. Choosing portable solar panels is not rocket science, but there are some details that should influence your decision. The first factor that should influence your decision is usage. What do you want your solar panel for? Depending on the purpose of your solar panels, you might need to change your search parameters. For example, the best solar panels for RV’s are generally around the 100 W size. The installation of these solar panel modules should not be complicated; however, it will consist of the installation of more than a couple of wires. 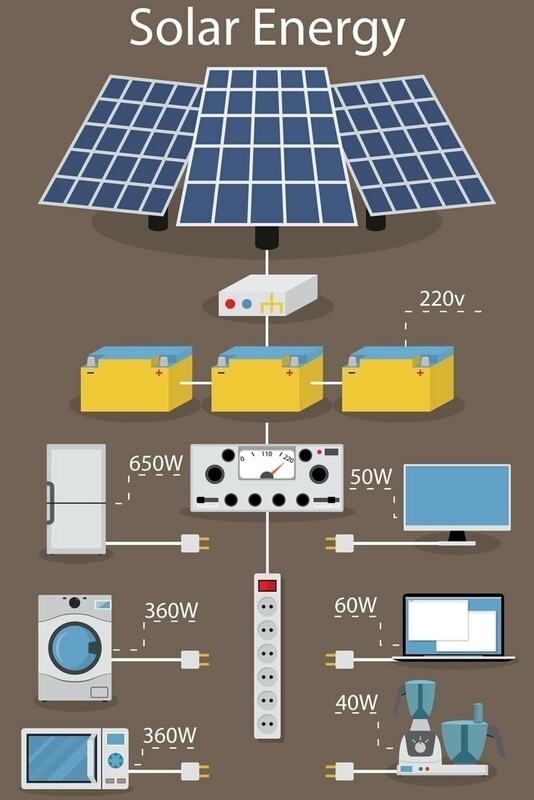 Solar panels for portable purposes are generally connected to lead acid batteries that will recharge over time, so it is also necessary to select the proper battery pack and charge controller to fully charge the energy storage devices and supply your off-grid needs. Boats could need large solar systems where battery packs are generally used to supply appliances bigger than a laptop or smartphone. An important consideration with these systems is to select marine solar panels that are water-resistant or waterproof due to obvious reasons. Water can be an important enemy for solar panels since moisture could get accumulated between the aluminum frame and the glass, which can lead to solar cell delamination. Therefore, choosing portable solar panels with encapsulating materials that ensure good water resistance is essential in these cases. The weight is another important variable. If you’re camping, you need something light for comfortability. If you’re hiking, portable solar panel kits must be ultra-lightweight. Low-weight portable solar chargers and folding solar panels that include USB ports for phone charging are the top references in this case. One of the most important things to look for is solar panel efficiency. Efficiency values are referred to the energy conversion rate from solar energy into DC electricity. If efficiency is higher, then it means that your solar panel will be smaller and will still produce the same power output. This is something that you definitely do not want to cut expenses in. Efficiency is one of the most valuable assets and indicators; the higher efficiency means lower weight, less surface area, and top-quality performance as well, as only top manufacturers design the best efficiencies. Crystalline technologies are the most popular ones in the grid-tied and off-grid markets. They have the largest market share and can be divided into polycrystalline and monocrystalline modules. However, given the importance of efficiency values as we mentioned earlier, for portable solar applications, it is advisable to choose the monocrystalline technology since it is established as the most efficient one. Thin-film technologies are also considered, mainly because of their flexibility and compact size. The disadvantage is that efficiency values are generally low when compared to monocrystalline, but still, their favorable maneuverability is very useful in the portable solar market. What Size and Wattage Do You Need? The next topic that you want to cover is related to the power size that you need. You’ll also need to know the estimated wattage that your solar panels must have to cover your energy needs. First, you need to understand some basic terminology related to electricity principles. The wattage is another term for power output. This parameter is referred to the combination of other two variables: voltage and current. Voltage is referred to the “pressure” that the electrons are receiving to flow, while current is referred to the amount of electrons that flow through a single wire. By understanding that power output can be obtained by multiplying voltage and current, we can estimate the amount of wattage that we need. Each electronic device has specific power consumptions that can always be found in the labels of the products. By adding the power consumptions of each device, we can have an idea of the minimum wattage of the solar panel that we need. 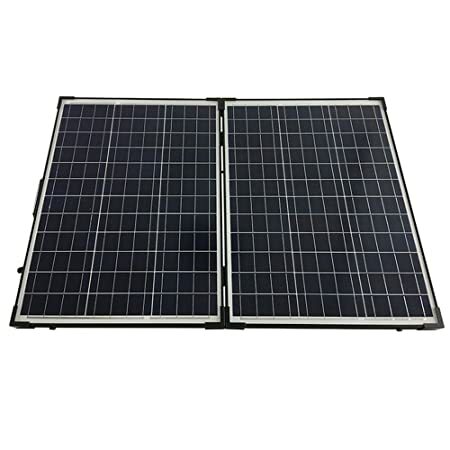 Nevertheless, this does not mean that if you have a 120 W appliance then you must look for a 120 W portable solar panel, it only means that you should avoid any solar panels below 120 W.
Solar power varies according to multiple environmental conditions. Solar irradiance values, shadings, temperature, and the amount of direct sunlight exposure changes the output power of your solar panel and can change the charging speed of your solar charger. Moreover, if you are purchasing solar panels for off-grid boat applications, you will probably use a battery pack and a charge controller. Some energy will be lost in the energy conversion process as well. Therefore, you must estimate the size of the solar panel a little above the specific demands if you want it to charge within a single day. Another important fact that we must take into account for the solar battery and the solar charger is the energy consumption. The difference between the amount of power consumption and energy is that power is referred to the instantaneous demand of an electronic device, while energy is referred to the demand over time. In other words, energy is power multiplied by the time of usage and is expressed in Wh. However, it is also important to know that energy can be expressed in terms of ampere-hour (Ah), since most solar battery capacities are expressed in this unit. To make the unit conversion, we can simply divide energy in Wh by voltage. For instance, let’s assume that our set of electronic devices consumes a total of 150 W of power. Assuming there will be 4 hours of daily use, we would have an energy demand of 600 Wh (enough to charge a phone and a laptop many times, use LED lights, connect a small fridge, and more). This can be translated into 50 Ah of solar battery capacity needed (assuming the typical solar battery voltage at 12 V). Now, we can use a simple formula to estimate the power needed in solar panels. We would need a 200-watt portable solar panel or two 100-W panels to have fully charged 12V and 50 Ah solar battery capacity within a single day. As you can see, the output power needed is bigger than the power demands of the appliances. It is important to mention that this is used to fully charge your portable solar banks within a single day. If you are ok with it taking longer to fully charge, then you can opt to purchase a smaller size. It will also be less expensive. Multiple devices can be charged, but to do so we must first understand how to set up everything correctly. Take for instance a camping situation. We will have our battery pack (probably lead-acid), our charge controller, our portable solar panels, our inverter, and a set of wires. After determining the power size, we will establish our connections in series or parallel according to the input current and voltage requirements of the charge controller. A series connection will add voltages and a parallel connection will add current. Once the terminal outputs are connected, we will need to connect each terminal output to the charge controller input. This device will determine the charging speed of the solar array and will show us if the battery is fully charged. From the controller, we will connect the terminal outputs to the energy storage device, verifying that the voltage output of the controller is the same as the nominal voltage of the battery packs. After we’ve have finished the battery connection, then we can wire the battery-based inverter to power AC loads. Other easier application scenarios are related to specifically charging phones. 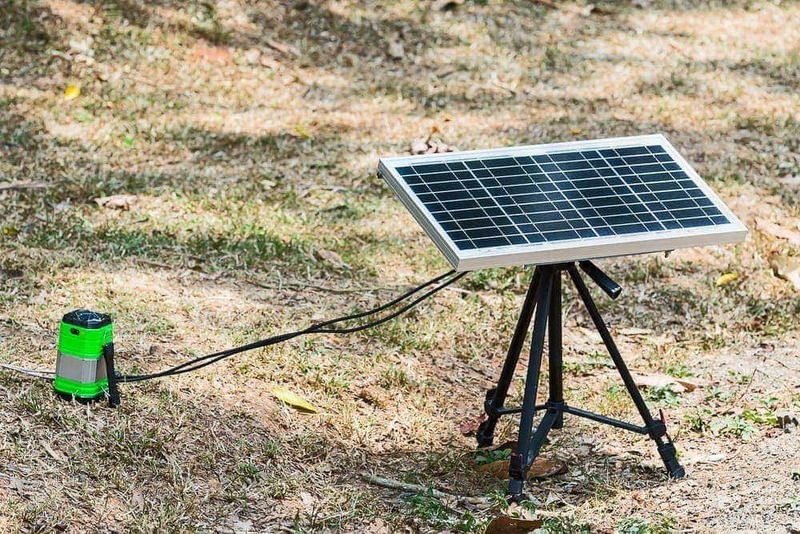 These devices are generally nice, appealing gadgets that allow you to connect your smartphone via USB ports directly into the portable solar generator. Designs can go from a backpack to a solar panel that looks just like a tablet that has USB ports to make life easier for you. These are also commonly known as a USB solar chargers. Portable solar chargers like these are more common nowadays due to their lighter weight. They are also easy to carry. Designs can be of the size of a smartphone with dual USB ports like the Solar Paper, which can also be attached to your backpack or suitcase. Here you cannot only connect your smartphone but also multiple devices like your Go Pro, an external battery, a flashlight and even speakers for a day in the park with good music around you. Flexible panels are also an excellent reference for portable solar applications. All that you need is to roll-out your solar cells and connect your gadgets directly to charge them. With portable solar panels an amazing charging speed can be achieved, charging smartphones up to 20% in just 10 minutes, that’s 75 % faster than connecting your phone to a power outlet. And all you need is a USB cable. The advantages of portable solar power widely overcome the downsides, however, an important fact must be taken into account. How do you keep them safe from thieves? Portable solar panels for camping or RV’s can constantly be exposed to dangerous situations in which thieves can take advantage of. To reduce the possibilities of stolen solar panel kits, a great option is to install a solar panel alarm system. Despite that the alarm systems have not become widespread in the market, there are still some valuable options to consider. These systems can be installed to warn you about any irregular movement in your solar panels and make the noise that could frustrate the person who is trying to steal them. Other people tend to think more about stainless steel bolts between the solar panels and other support like a table that would be hard to remove. Others opt to install a key lock between the portable solar power system that could only be dismounted or moved by using a special key. Another option is to install an HD camera that faces the thief, and it links it to a website that can be verified and checked from wherever you are. That way, if you leave your things back in the camp but you still have your smartphone, you will be able to check your campsite using your mobile data. It may not stop the thief from stealing your portable solar panel, but it will catch the face of the person who did it. Owners of portable solar power systems also tend to verify the serial numbers of their solar panels. Why? Because the serial number can be traceable, and if the thief is foolish enough to try and sell it, it can be tracked and verified. Dust and dirt can radically affect the performance of your portable solar power system because they reduce the amount of light that the solar cells can absorb. Especially in an outdoor environment where it is more common to find sand and dirt. Solar power is reliable, but it does require a little attention. Taking care of your solar panels means doing a little maintenance every once in a while. The cleaning can be done anytime, and since the device is very small it won’t take more than a few minutes. The first thing to understand is that the cleaning process is quite easy. You must simply use a soft brush or sponge with a little bit of water. It is not necessary to use detergent, chlorine or any other type of liquid. Actually, it is not recommended to do so because some chemicals can be abrasive for the solar panel and damage the encapsulating materials, which could even lead to damaging the solar cells. 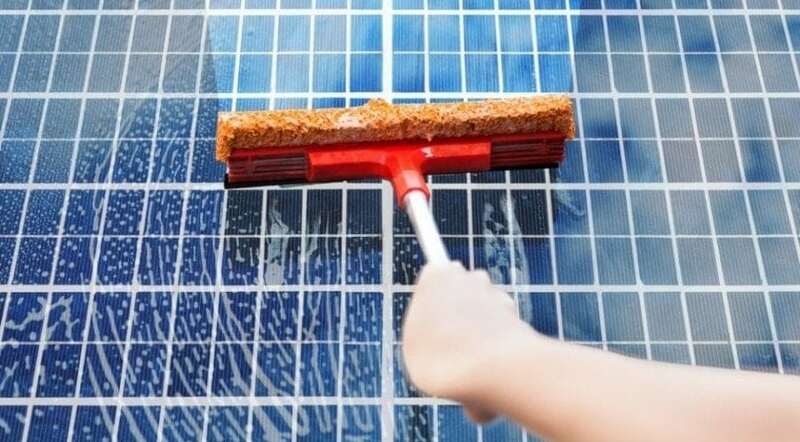 To guarantee that you will have your portable solar panels for electricity production a long time, just apply water (avoid water with high mineral content) to the soft brush and start cleaning the surface area of the glass. Among other valuable cleaning tips, avoid high-pressure water to do it. Solar power systems on rooftops may need a hose to do the cleaning, but the pressure is not the same for a rooftop solar panel system as it is for a portable solar panel kit. Besides, since your portable solar power kit is only composed of a couple of solar panels, it won’t be too much sacrifice. Portable folding solar panels must be constantly mounted and dismounted, therefore, providing a simple and comfortable installation process is a basic principle of their design. It is as simple as opening the kit, unfolding the solar panels, adjusting the legs to provide the proper tilt, then setting the charge controller that is generally already mounted behind and connecting the output of the charge controller to the 12 V batteries. These foldable solar panels do not need any additional support besides the legs to secure them. Other portable solar panels are designed to be flexible. These can be easily secured by using an eternabond tape and a little bit of Velcro attached in the backside of the solar panel. Once you add Velcro in the upper and lower side of the panel, you can use the eternabond tape to secure all of the solar panels to the roof of the RV. You just need to cover all the external borders of the module, making sure that you are not blocking any sunlight for the solar cells. Another good idea is to install a flexible solar panel window. To do so, you need PVC tubes, L and T PVC pieces, and some stainless-steel screws. You can attach 4 L PVC pieces to the four corners of the solar panel and the two T pieces to act as the PVC legs of the solar panel, then you can use suction cups to attach them to the window and set the right tilt angle by using the PVC legs. You can watch a detailed explanation here. ecotality.com is a participant in the Amazon Services LLC Associates Program, an affiliate advertising program designed to provide a means for sites to earn advertising fees by advertising and linking to Amazon.com.